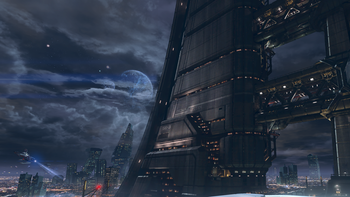 Skyline is a Halo 4 multiplayer map. It was released as part of the Majestic Map Pack on February 25, 2013. The map is a simulation of level 512 area A06 of Nova Austin Station, a space elevator currently under construction by Lethbridge Industrial, located in the city of Mindoro on Cascade. The billboard above the rooftop lists Elysium City, New Albany, and Casbah, possibly as the sites of other construction projects. This implies that the cities' respective planets were reterraformed after being glassed. Lethbridge Industrial either supplied materials, or was a company responsible for construction of the tether. Signs found in the level indicate that it takes place on the 512th level. Assuming the floors start at ground level and are of dimensions similar to modern skyscrapers, this would make the level more than two and a half times as high as the Burj Khalifa, or more than 2 kilometers (1.24 miles) high. Skyline features the only appearance of the AV-14 Hornet in Halo 4. It serves as an indestructible piece of background scenery. A view of Skyline. Note the Hornet in the background. The hornet on skyline. This picture was released as a teaser for the map. A map of Nova Austin's 512th floor.